« Thank you, Longwood Homemakers’ Association! 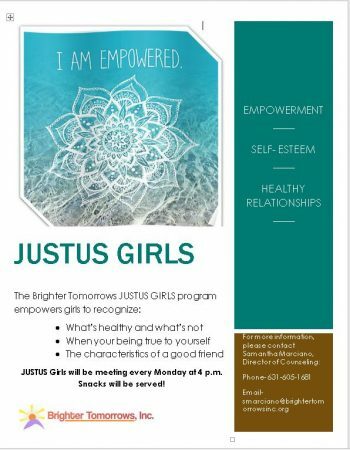 JustUs Girls is a therapeutic group for girls ages 12-15 that focuses on female empowerment and healthy relationships.The goals of the group are to increase self-awareness, self-esteem, and improve communication skills. The curriculum also includes the dynamics of dating violence and how to access support. Brighter Tomorrows, Inc. runs JustUs Girls in homeless shelters throughout Suffolk County. If you are interested in bringing this program to your facility please contact Samantha Marciano, Director of Counseling, at (631) 395-1801 ext. 112. This entry was posted in Counseling, Latest News. Bookmark the permalink. Follow any comments here with the RSS feed for this post. Both comments and trackbacks are currently closed.